Send RTF formatted mail in bulk using Apple Mail. Is there a better alternative to MailToBotic2? Is MailToBotic2 really the best app in Email category? Will MailToBotic2 work good on macOS 10.13.4? 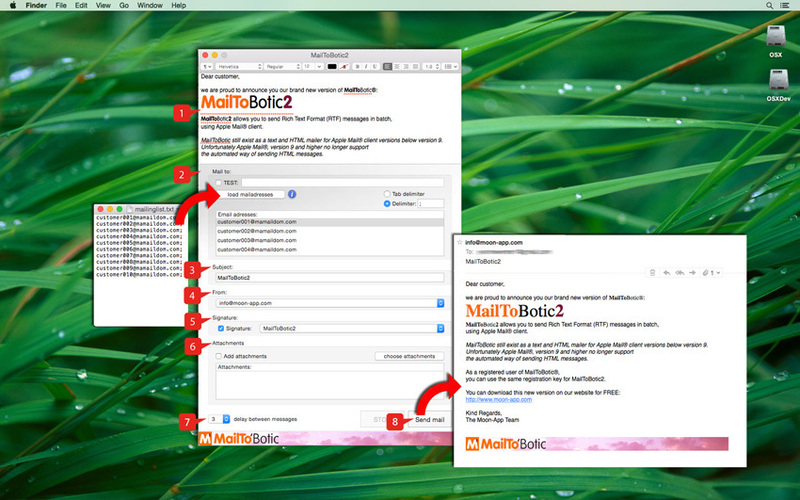 MailToBotic2 lets you send RTF formatted mail in bulk using Apple Mail. and MailToBotic2 will send the mail automatically to every single mail contact. Especially created for small businesses, organizations, associations, user groups, etc. MailToBotic2 needs a review. Be the first to review this app and get the discussion started! MailToBotic2 needs a rating. Be the first to rate this app and get the discussion started!